How many times have you found yourself scrutinizing your smile in the mirror? Or analyzing your smile in photos on Facebook and Instagram? You’ve probably thought that achieving your perfect smile is simply out of reach, but what you might not know is that there are so many implant & cosmetic dentistry options for improving your smile. Possessing a strong sense of pride and well-being leads to more smiling and smiling is known to be contagious. People who love their smile tend to be happier, more outgoing, and more successful. Implant & cosmetic dentistry help you achieve these goals by improving the look and health of your smile. So what are you waiting for? What Treatments are Right for Me? Common reasons people don’t love their smile include staining, chipped teeth, cracked teeth, small teeth, large teeth, gum recession, gummy smile, crooked teeth, crowded teeth, overlapping teeth, overbite, under bite, and missing teeth. The great news is all of these conditions can be treated right in our Costa Mesa dental office by Dr. Jeremy Jorgenson. Dental implants are a great long-term solution to replacing missing teeth. We strongly recommend choosing an experienced doctor and an implant made by a reputable company. Remember, cheaper is definitely not better when it comes to your health. We place dental implants in a 3-step process. During step 1, we place the implant screw into the jaw and allow 3-4 months for the jaw bone to grow in around the screw like a natural tooth root. You will have a temporary tooth during this time. Next, we place the custom abutment and prep for the permanent crown. The custom abutment is the anchor for the dental crown and made for the specific screw that was placed. In the last step, we cement the permanent crown, all-ceramic, strong, natural-looking tooth, that attaches to the abutment. 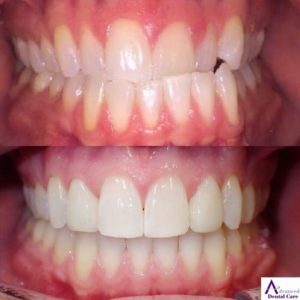 There are many procedures that fall under Cosmetic Dentistry so we want to tell you about our top 4 ways to quickly and effectively enhance the look of your smile. We offer 3 types of teeth whitening at our Costa Mesa dental office. 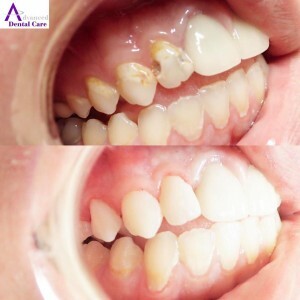 Depending on types of staining, condition of teeth, sensitivity level, and budget, we will recommend the best solution to achieve the best results. See Jose R. here and Kathy B. here. Dental bonding is also a great way to quickly repair chips or add size or dimension to a tooth. 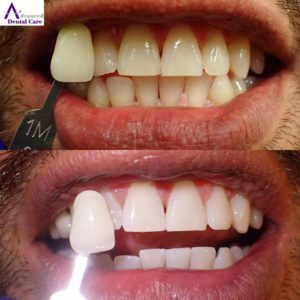 The bonding procedure is similar to dental fillings in that we use the same composite material and match the composite to your tooth shade for a natural looking repair in just one visit. See Courtney D. here and Alicia M. here. Dental veneers are thin-sheets of porcelain that we bond to the front of your tooth. 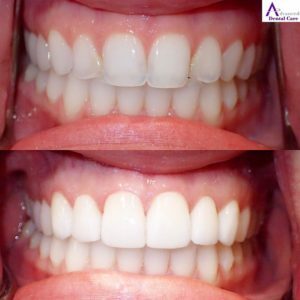 The great thing about dental veneers is that you can change the look, shade, and shape of your smile allowing you to choose the type of smile you want to achieve. The veneers are custom-made just for when and to the specifications you choose with Dr. Jorgenson. See Libby J. here. Invisalign is also an orthodontic procedure and provides not only a more desirable smile, but a healthier one too! Straight teeth in the correct alignment often resolves many grinding, clenching, TMJ, gum recession, and plaque/tartar issues that result from crooked or misaligned teeth. The Invisalign process starts with a custom treatment plan with custom made trays just for you! The teeth slowly move into the correct position until treatment is complete. With Invisalign you also have the added benefit of being able to take the trays out to eat and to brush your teeth. See Mike P. here. 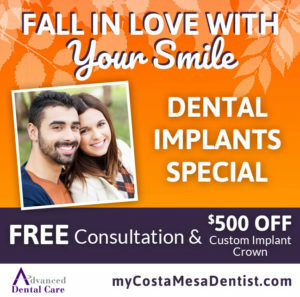 Explore your options during a consult with Dr. Jeremy Jorgenson at our Costa Mesa dental office today! Call 714-424-9099 or book online anytime at www.mycostamesadentist.com.